AC1900 and AC1750 routers are quite popular and many people want to choose between them. To help you to make the decision, we’ll compare them in this article. We’ll start by looking at the numbers and the difference between them. What is the difference between AC1900 and AC1750? AC refers to the theoretical speed of the device with the wireless 5GHz and 2.4GHz totals combined. Manufacturers rely on this as a convenient solution to show the speed that their routers can run at. In general, AC1900 routers run at 1.3Gbps (1,300Mbps) on the 5GHz AC band with an additional 600Mbps on the 2.4Gbps band. Since 1,300 plus 600Mbps equals 1,900, you get AC1900. AC1750 is a cumulative of the 5 and 2.4GHz bands. The rule in this case is that we see 1.3Gbps on the 5GHz, although in this case, with 450Mbps on the 2.4GHz band. If we have 1,300Mbps + 450Mbps = 1,750Mbps so we have AC1750. While the Netgear Nighthawk R7000 is also a great option and there is not a lot of difference between it and the Asus RT-AC68U, overall the latter is a better choice.The RT-AC68U is a highly popular solution and previously, it was considered the fastest option available. 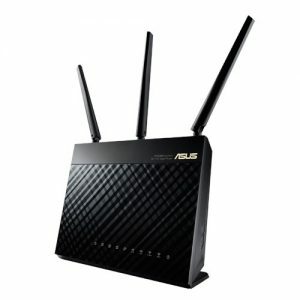 Although there are faster routers available nowadays, that doesn’t mean that the RT-AC68U is not a great device. Another advantage of this router is that it is cheaper nowadays so you can get this high quality solution for less. Beamforming – You can enjoy better coverage at home. It is possible for clients to roam further away from the router. Dual Core Processor – A router of this capacity, needs enough processing power to avoid lag or overheating. The RT-AC68U features a Broadcom 800MHz dual core CPU. USB 3.0 – Apart from the 3.0 port, you get an additional USB 2.0 port, which can come very handy. Quality of Service (QoS) – It is possible to implement prioritization into your network with the help pf QoS. When accessing the Internet, this is crucial since it prevents bandwidth hoggers who can affect your experience. VPN Server – With OpenVPN or PPTP, it is possible to secure access to your internal home network from the Internet. This means that if you have files attached to the RT-AC68U via a USB drive, they can be grabbed remotely, which is great for productivity and everything else. The former flagship router from Linksys is a convenient solution that uses a dual core processor, two USB ports (one of which is 3.0), Beamforming and 3 antennas that you can adjust as you prefer. This is one of the most popular options when it comes to AC1900 routers. It is a great alternative to the Asus model. The Nighthawk R7000 features 1GHz dual core CPU, USB ports and Beamforming technology. Asus shows again that it is a powerful brand and its RT-AC66U grabs the title of the best option in the AC1750 category. Originally launched in 2012, this router is still a strong solution thanks to its great selection of features. Beamforming – The AiRadar looks after the Beamforming, extending coverage and ensuring that connectivity is strong at the longer ranges. USB 3.0 and 2.0 – This router also has dual USB ports. Just make sure that you use the USB 3.0 when you have a USB 3.0 drive. You can share videos within your home network over AC as well. QoS – Quality of Service is another feature that you will find in this router and it makes sure that the sensitive data traffic is protected. TP-Link is a manufacturer that is recognized for offering amazing devices at affordable prices. This AC router is a good example of the quality that TP-Link provides and you can get it for just around $100. The R6400 was launched to replace the R6300, the first device from Netgear that supported 802.11ac. While it is a fairly new option, it is very solid and it offers all the necessary features to make it an option that definitely deserves to be checked.